Classic design needs no improvement. 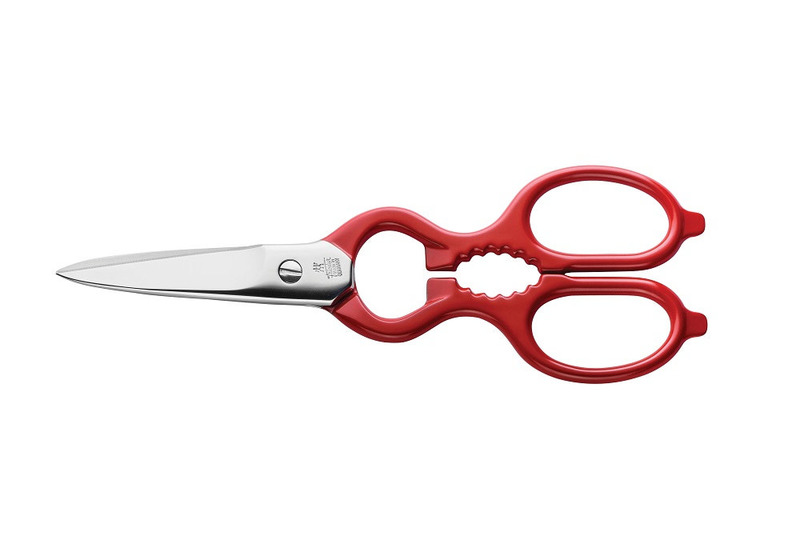 These red multi-purpose scissors from the ZWILLING scissor range have helped households for over 75 years - unchanged in their form and function. Cut herbs, paper or even carpet safely. Thanks to clever additional functions, you can also open bottles, lids and tops effortlessly. This is thanks, among other things, to the toothed recess grip. The sturdy scissor blades are made of special formula steel and sanded by hand in proven ZWILLING tradition. The material to be cut will not slip away, as it is securely held by micro teeth. Even slippery material can be cut effortlessly. The durable special formula stainless steel is specially refined, so the multi-purpose scissors last a long time. The ice-hardened blades are corrosion-resistant. The wide, ergonomic handles are comfortable to hold, allowing you to exert full power. Owning the 20 cm long multi-purpose scissors in red from the ZWILLING kitchen tools range, you become part of the tradition and will enjoy a durable helpful tool for everyday life. The forged, robust scissor blades are sharpened by hand.